Sorry, no shipping outside the United States. Elly Award winning dancer/instructor, Daleela Morad, teaches you beginning belly dance isolations/movements as part of your basic training. She also teaches you how to gracefully enter and exit with a beautiful veil. What's more, you will see how these movements may be put together in a simple but elegant dance. Andrea uses the movements from this DVD to improvise a beautiful show for you. It is recommended (though not necessary) that the beginner read the book, Belly Dance Wisdom, to supplement this DVD. 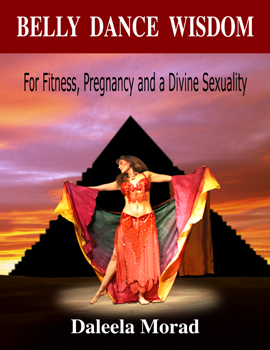 The book includes the origins of the belly dance, the benefits of belly dancing while pregnant, and how belly dance can enhance your sexuality. Daleela's book and companion DVD, can be extreme self-esteem boosters. Together, they open the door for women of all shapes and ages to learn how to tap into the self through the power of belly dancing. The print (or E book) may be purchased online through http://www.booklocker.com/books/2732.html. Only $20, plus S & H.
To order email: daleeladances@sbcglobal.net, or call Daleela at: 916-804-5569. Available for purchase in Daleela's classes. 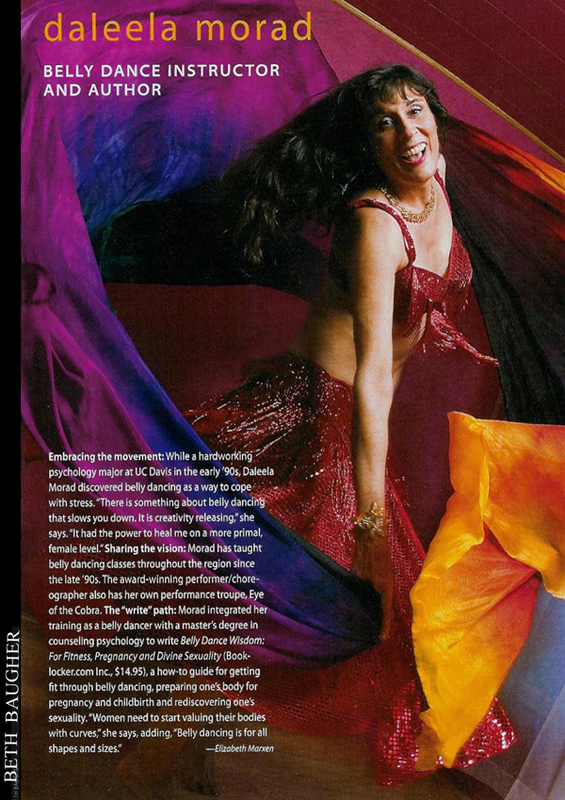 Elly-Award winning dancer/choreographer, Daleela Morad, presents fun, step-by-step belly dance instruction for the beginner. Be prepared to undertake a fascinating journey into the wonderful world of belly dance. You will learn exotic Egyptian style movement combinations quickly and effectively. In this DVD, you will dance away with 26 exciting belly dance combinations.. You can then draw from these to create your very own beautiful dance routine sure to impress friends, family or that special someone! So kick off your tedious work shoes and dance away. No one is watching! Elly-Award winning dancer/choreographer, Daleela Morad, presents fun, step-by-step intermediate/advanced level belly dance instruction for the more experienced student. Be prepared to undertake a fascinating journey into the wonderful world of belly dance. In this DVD, you will expand upon your basic knowledge of the combinations you learned in level 1. Daleela presents the same exciting 26 belly dance combinations at a more advanced level. The movements may be faster, up on the toes, involve more traveling and may be layered with shimmies. You can draw from these combinations to create your own beautiful dance choreography to impress friends, family or that special someone. Daleela is a mental health professional with a master's degree in psychology. She is also an accomplished oriental dancer. This DVD combines her background in psychology and in the performing arts to convey the importance expressing emotions is for our mental and emotional health. Through works from famous artists such as author Stephen Levine, composers Hossam Ramzy and Phil Thornton, painter Carlo Maria Mariani and poet, Joyce Odam, this DVD conveys the power dance, art and poetry have to heal the human heart. Through modern interpretive belly dance, Daleela demonstrates the power music, and dance possess to move an individual from loss and grief to joy and celebration. All profits go to the Tourette Syndrome Association of Sacramento. I Know Who I Am When I Belly Dance! This self help book stands apart from other dance books because a trained professional in psychology presents belly dance as therapy. In a world that teaches us to constantly be on the go, belly dance, the epitome of the feminine, teaches us how to slow down, connect to our bodies and embrace a female spirituality sorely lacking in our culture. Long before Greek and Roman times, our ancestors revered women's power to unify their clans through their ability to nurture and heal. Because the belly dance epitomizes the feminine, it has the potential to help you reconnect to this natural feminine strength. Pearls of dance wisdom for dancers of all levels. Connect to the core of who you are as a woman! Nothing soothes the civilized female soul more than belly dancing. It is one of the most natural and effective ways to nurture your female self. As a natural woman who embraces her feminine attributes and her sexuality, you become powerful, creative and effective in the world! As a belly-dance student, I know how useful it can be to see pictures with descriptions of specific dance moves, and Daleela Morad's Belly Dance Wisdom is the perfect resource. It's an easy-to-read, step-by-step guide for beginners that includes informative features such as the Middle Eastern origin of the art form; the health benefits of belly dancing while pregnant; and how belly dance can enhance sexuality. Morad holds a Master's Degree in Marriage, Family and Child Therapy, and uses her dancing skills to convey how important it is for women to have peace of mind and a positive self-image. Her book can be an extreme self-esteem booster, and there is a deep and profound paragraph (on pages 101-102) that I believe all women should read. Morad opens the door for all to learn the art and power of belly dancing as well as as the benefits of tapping into one's self: "Belly dance as therapy means to dance for fun." Morad resides in Sacramento, California, where she performs with her daughter, Andrea. She also heads the dance troupe, The Eye of the Cobra, and offers the belly dance video Healing Dances for the Human Heart.